We combine molecular biology, imaging microscopy and electrophysiology to study ion transport by lung airway epithelial cells and effects of Pseudomonas aeruginosa, particularly related to the disease cystic fibrosis (CF). 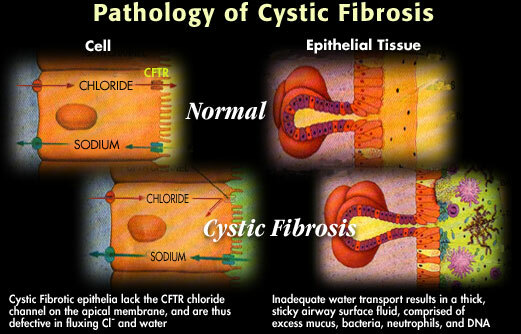 CF is a genetic disease resulting from defects in the cystic fibrosis transmembrane conductance regulator (CFTR), an anion selective channel that is found in the apical membrane of many epithelial cells and prominently in the lung airway epithelia. 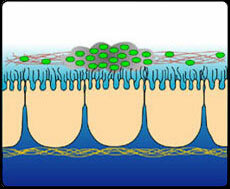 In the majority of cases, the disease results from a mutated CFTR gene that causes the channel to be processed incorrectly in the endoplasmic reticulum, being degraded rather than trafficked through the secretory pathway and delivered to the apical plasma membrane. The lack of a functional Cl channel in the airways leads to thick, sticky mucus (due to reduced secretion of Cl, Na and water into the airways) and, apparently, altered ion content of the airway surface liquid. These alterations somehow allow P. aeruginosa to colonize the lungs of CF individuals. In response, the immune system is activated (perhaps over-activated), leading to the influx of neutrophils which attempt to clear the bacteria. The battle between neutrophils and bacteria leads ultimately to lung fibrosis and damage, and patients usually die in their late 20's from chronic infections and damage to the lungs. Colonization of CF Lung: Altered airway lumen promotes P aeruginosa colonization. 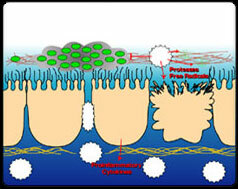 Biofilm protects bugs and promotes hypermutation. Immune Attack: "Hyperinflammation" as recruited neutrophils unable to eradicate bugs, instead damage lung tissue.